As many of you know my wife Mandy has taken a new job at Seattle Christian School as their high school art teacher. Mandy has such a great perspective on art and really wants to make sure that all of her students know that there are many different mediums to showcase their art. Her plan for the class is to bring in guest speakers on occasion to share a little bit about what they do and give the kids a glimpse into their world. Guest speakers might include a chef, interior designer, professional photographer, graphic designer. I'm still surprised but she asked me to speak to all of her classes about photography. Obviously I'm not the "professional photographer" that I mentioned before. I only wish! Her reasoning for using me was to show the kids that a left brained guy like myself could find a way to use the right side of his brain. Now I speak to CEOs and CFOs quite a bit for my job but for some reason the idea of speaking to 6 classes of high schoolers made me really nervous. The day came and it turned out great! Once I got talking about photography and sharing some of the photos I've taken thus far I felt very comfortable. I tried to make it interactive and ask them some questions. I only hope that the excitement I showed during the classes hit a nerve with them and at least one of them has a bit more confidence in themselves and what they could do artistically. I remember what it was like being in the art class and having the kid sitting next to you who could potentially be the next Picasso or Michelangelo while you're still trying to figure out what complimentary colors are. The photo below is one I showed them and I used it to try and explain shutter speed. I simply asked them whether they thought the photo had a fast shutter speed or a long shutter speed. Pretty much every answer I got from them was a unanimous "fast shutter speed!!" 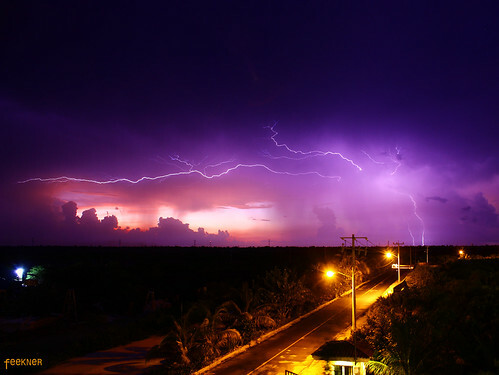 Their reasoning was that lightning is a split second event so they would need a fast shutter speed. It was fun to explain to them the difference between the two and tell them it was actually a slow shutter speed. You could see a light bulb go off in their heads. This shot from our summer trip to Cancun was taken leaving the shutter open for 15 seconds which gave me a better chance during that time to capture a lighting strike. Hope you enjoy! Thanks for reading and visiting! Feel free to say hi and leave a comment!